This model is one of the most versatile ever made. 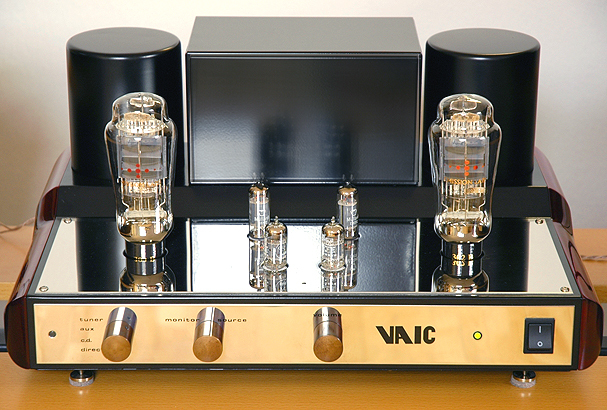 It is an "integrated" amplifier, meaning you have a normal SE tube amplifier, and a pre-amplifier integrated. These are separate circuits. When you use the internal preamplifier, you have a volume control and a selector for CD, Tuner, etc. When you use the "direct" option, you enter the signal directly to the driver tubes (larger tubes in the middle) and the pre-amp is taken out of the circuit by means of relays. Of course you need your own pre-amp in this case! All Yamamoto Teflon/Gold sockets. The special suspension construction of the original sockets was kept. custom made fixture, to replace the chinese sockets by Yamamoto Teflon. 4 x Noval sockets used for Pre-amp board. Bias Setting of the 300B tubes can be done through the front plate, as with the later AYON models. Measuring of the bias level can be done through a high Quality BNC plug, at the back. A cable is supplied with it. All you need is a Volt meter to do the setting yourself. No need any more to have a service technician visit you. No need to open the amplifier any more. Signal wiring of the potentiometer done with silver plated Teflon cable. 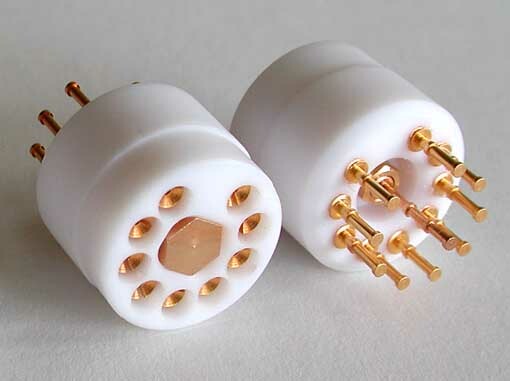 Pre-amp tubes can be AC heated as original, or DC heated with an external power supply. DC or AC heating can be selected from the back with a locking switch. The external DC power supply belongs to the amplifier. The DC heating removes last fraction of hum, and also increases the types of pre-amp tubes that can be used. NEW, unused Emission Labs 302B tubes. NOS, unused Mullard E182CC driver tubes. NOS, very little hours "CIFTE" 6189WA pr-amp tubes. Volume control can be done by hand, or by using the remote motor control. (An electric motor moves the volume control). This part has cost 175 Euro new. It is included with the amplifier. It is made of piano lacquered wood. Tube filament voltage and bias voltage is adjustable. A wide variety for power tubes can be used, like 300B, TJ 300B/n, AD100, 320B-XLS, and even the wonderful 520B tube! ALPS Volume Potentiometer, conductive plastic - noiseless. Step: After 10 seconds pre-glow, HV will switch-on of the power tubes. Step: Analog electronic circuit will provide Slow ramp-up of the plate current (5 seconds) after applying high voltage. Litz wire SE transformers, double potted. Internal fuse + external fused. / Mains fuse can be replaced by user. Deck plate and front plate are Rhodium plated. This gives a beautiful shine, and will not scratch. Wooden sides are piano laquered. Bottom has spikes attached to it. The amplifier is in excellent overall condition, and was recently completely serviced. All you need to do is plug it in, and play. This is a wonderfull piece of heavy metal, and VAIC amplifiers are not made like this any more! Optional, several NOS and new tubes, belonging to this amplifier could be purchased from the current owner. A Test report (in German) about this amplifier as published in "Image HiFi" can be send to you by email. Please ask when you want to receive a copy.